Christien & Yas, ran the Virgin Sport 10k Run in July 2017 to raise an amazing £1,190 for the Bromley Dementia Support Hub. 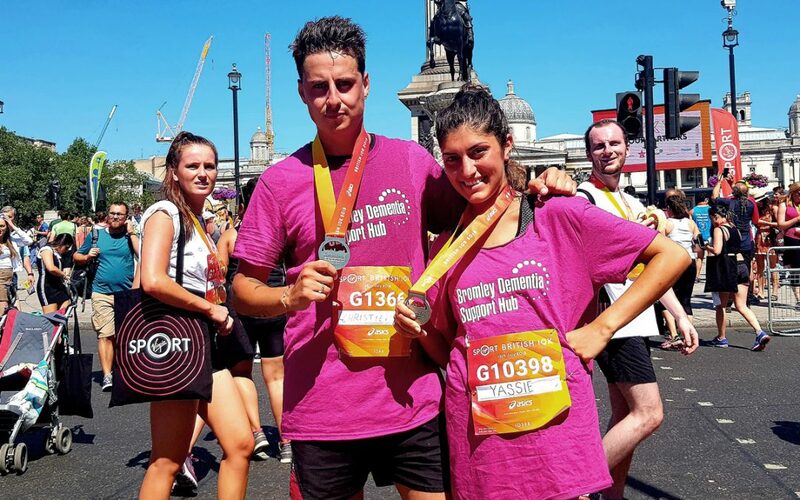 “My girlfriend, Yas and I, ran the Virgin 10k Run because our hero, Nanny J, was diagnosed with dementia, which over the years has sadly got progressively worse. But with the help of Bromley Dementia Support Hub, things have become easier and less of a taboo for us all as a family! Our arrangements with Nan have become more organised and smooth, and we thankfully have a huge understanding now of how to act and cope ourselves with this illness. The Hub offers some incredible services for families affected including personalised coaching in the home for families, focusing on your own experiences, challenges and needs as a carer of a person with dementia. Offering helpful advice and aids with planning for the future, the Hub will help understanding and accessing all the support you are legally entitled to as a carer. It was extremely comforting discussing everything involved in our within own home, making it less daunting for us all, and particularly for Nan.